So basically i get this very annoying issue in fortnite where if i move my mouse fast the game just seems to look altogether blurry and very annoying when im trying to fight or build quickly. Weirdly enough after every update my game feels super smooth and really nice but then after that 1 or 2 games or if i restart my game it goes back to the motion blur issue. I have my OD setting on maximum if i lower it to "normal" od or off the issue just gets blurry and more blurry. Any help would be appreciated. No responses.. jeez thanks guy. The only thing I can suggest is setting "preferred refresh rate" to "highest available" just in case your problem is that for some reason the game tries to switch to 60Hz. Use the monitor's OSD to see what Hz it's currently set to. Also monitor your FPS in the game. I think fortnite has an FPS indicator you can switch on? Use that. Then see what FPS you get when everything looks fine, and when it looks blurry. Myself (Chief Blur Buster) has been busy on several things. welcomess wrote: So basically i get this very annoying issue in fortnite where if i move my mouse fast the game just seems to look altogether blurry and very annoying when im trying to fight or build quickly. Weirdly enough after every update my game feels super smooth and really nice but then after that 1 or 2 games or if i restart my game it goes back to the motion blur issue. I have my OD setting on maximum if i lower it to "normal" od or off the issue just gets blurry and more blurry. Any help would be appreciated. In case people are confused.... Just to be clear: The "Motion Blur Reduction" forum is usually used by users of "Motion Blur Reduction" features on a monitor. Does your monitor have a Motion Blur Reduction feature? For general Overdrive problems and other display problems, it's best to use General Forum. There will be better replies that way. There is always a maximum ceiling of motion blur reduction you can get with common sample-and-hold LCDs, especially at 60 Hz -- motion blur (persistence) is directly proportional to frame visibility time. If you want blur reduction without unobtainium framerates, I recommend motion blur reduction features such as ULMB, DyAc, ELMB, etc. ULMB can eliminate more motion blur than a 500fps@500Hz display, because of the way persistence is lowered via a strobe-backlight (achieving CRT motion clarity). For displays with insignificant GtG (e.g. 1ms TN), your display persistence of a non-strobed display will be fully limited by frame duration time, which can not be shorter than the duration of a refresh cycle. e.g. 100fps (on a 100Hz+ display) equals 10ms persistence (10 pixels of motion blur per 1000 pixels/sec), completely unavoidable without motion blur reduction feature. Likewise, your frame duration time on a non-strobed display can never be shorter than the duration of a single refresh cycle, so a higher Hz display will produce less motion blurring (on average) than a lower Hz display, provided pixel transition time remains significantly faster than the duration of a single refresh cycle. 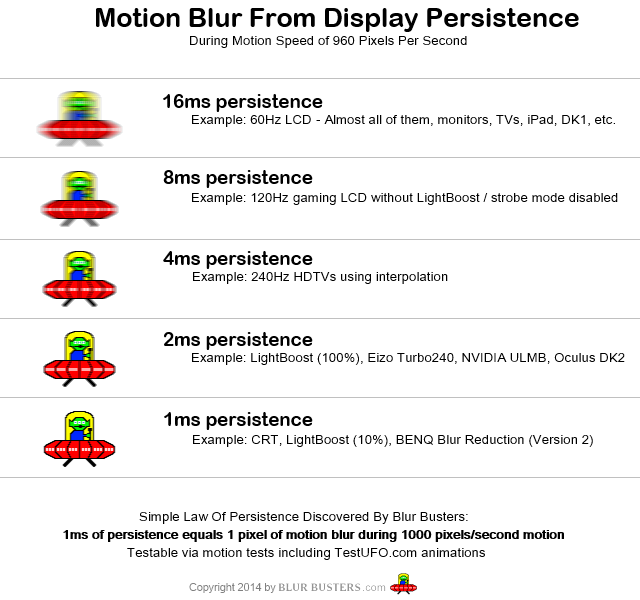 Hope this info helps you understand display motion blur! RealNC wrote: The only thing I can suggest is setting "preferred refresh rate" to "highest available" just in case your problem is that for some reason the game tries to switch to 60Hz. Use the monitor's OSD to see what Hz it's currently set to. The issue is that i get the issue no matter if im above the 240fps mark.. I am really lost on what to do if i have overdrive off the game just looks more blurry and slower then ever but with it on maximum the game looks alot faster but still gets the issue..
Is there anyway to use ULMB at 240hz the 144hz ulmb just seems too laggy for my eye. Any other suggestions you can give me please.. The laggy feeling could be any number of things,from wildly fluctuating fps to fatigue. You ever stare into a strobe-light and found yourself feeling nauseous for a second? Since MBR — as far as I've come to understand it — essentially turns your monitor back-light into a strobe-light, except very fast as to enhance clarity. Think of it as a spotlight lighting up the latest frame by the gpu, screaming, "hey, focus on me!" [...] the game just seems to look altogether blurry and very annoying when im trying to fight or build quickly. Personal visual preference but I've found disabling driver controlled LOD bias, and setting it to a clamped with a negative LOD bias of -1.75 * makes most games, and specifically Fortnite look so much crisper. * Again, -1.75 is subjective. If you read through the - LOD Bias thread I linked you'll see they suggest a value of -1.5 — however, I assume since I'm running games at 1440p, sharpness wasn't quite there at that value. Some applications use negative LOD bias to sharpen texture filtering. This sharpens the stationary image but introduces aliasing when the scene is in motion. So it makes sense that locking LOD bias to a negative value would ensure maximum clarity at the cost of aliasing. Since you don't use in game aliasing, you'd probably end up with a TON of jaggies. If that's that case then I'd reconsider keeping it disabled. If you enable, I suggest either high or epic since either low or medium *appear to* coorellate to FXAA low and FXAA high, high and epic to SMAA medium and high. Is there an index of tests of different monitors for this? Otherwise, I am not sure how it helps. notthatjesus wrote: The laggy feeling could be any number of things,from wildly fluctuating fps to fatigue. There is an approximately half-frame latency from a blur reduction mode. Some monitors have a much less laggy blur reduction mode (e.g. The BenQ Zowie XL2546 has one of the world's lowest lag blur reduction modes). Also, there's a latency asymmetry effect that can occur when combining VSYNC OFF with blur reduction. This is because VSYNC OFF is scanout-following, so frameslices have different latency offsets depending on where the frameslice is on the screen. And a strobe backlight is all-at-once, while an LCD panel is a top-to-bottom scan. So at 500fps on a 144Hz blur reduction display, VSYNC OFF for top frameslice may only have 2ms lag and bottom frameslice is equal in 2ms lag. But since strobing only occurs after the top-to-bottom refreshing action has occured, that means VSYNC OFF + ULMB can mean (2ms + 1/144sec) for top frameslice, and (2ms + 0.5/144sec) for middle frameslice, and (2ms + 0/144sec) for bottom frameslice. Since the screen is scanned-out in the dark from top-to-bottom, so the top edge has more waiting until the whole backlight is finally flashed. You can see this in the high speed video of LightBoost, that LCD panels are top-to-bottom refreshing, and that a strobe backlight keeps the screen in dark longer before the strobe backlight is flashed. So photons-to-eyeballs for top edge are delayed more than for bottom edge of screen. Since the bottom edge is the most recently refreshed (in total darkness) before the strobe backlight is flashed. Even though a strobe backlight is flashing all-at-once, the reality is between the flashes, the screen is still being refreshed top-to-bottom (just in total darkness, unseen by eyes). Whatever the GPU is transmitting to the monitor (current VSYNC OFF frameslice at instant) is being "displayed", just unseen until the flash. So VSYNC OFF frameslices at the top gets more input lag than frameslices at bottom edge of screen. Thusly, the "input lag gradient asymmetry effect" that combining VSYNC OFF and blur reduction creates. For better sync of lag by surface area, VSYNC ON works better but adds a lot more additional lag (unless using low-lag tricks). So it's simply better to simply use ultra-high Hz with highest VSYNC OFF framerate, while also trying to control your mouse microstutters as much as possible. The higher the Hz, the less lag penalty (and less lag gradient/asymmetry effect) a blur reduction backlight has. So that's why among competitive game players, BenQ XL2546 240Hz DyAc strobing can be an option if strobing lag is a big problem. There are pros/cons, using the right tool for the right job -- HOWTO: Using ULMB Beautifully or Competitively. Now, if you turn off motion blur reduction and simply use Overdrive, the additional motion blur comes back. It's pick-your-poison. You have to decide if you prefer motion blur, or if you prefer blur reduction. Here's another theory, your framerate of 240fps may be suddenly falling to 60fps intermittently. That generates 4x more motion blur, http://www.testufo.com demonstrates this well, 240fps vs 120fps vs 60fps. Are you SURE you are running 240 frames per second? Also, make sure to unplug (completely) all 60Hz monitors. If you earn money in eSports -- or depend on ultra-competitive gameplay where milliseconds matter -- Never run multimonitor. Do not run a 240Hz monitor and a 60Hz monitor simultaneously. Sometimes the 60Hz secondary monitor injects lag problems into the 240Hz. And/or suddenly reducing framerates to 60 frames per second (4 times more motion blur). The sudden appearance/disappearance of motion blur can be an undiagnosed framerate-halving or framerate-quartering problem, which is extremely common (unfortunately) on mixed-Hz multimonitor setups. On a 240Hz monitor, this shows up as 240fps+120fps+60fps in Chrome/FireFox browsers. On a 120Hz monitor, this shows up as 120fps+60fps+30fps in Chrome/FireFox browsers. On a 60Hz monitor, this shows up as 60fps+30fps+15fps in Chrome/FireFox browsers. Persistence (motion blur) is determined by frame visibility time. Which is shortened by an increased number of images per second (aka refresh cycles per second, ala visible frames per second) on a sample-and-hold display. That said, when running at lower framerates (without framerate-vs-Hz aliasing effects -- e.g. integral divisor framerates or VRR) -- then at 60fps, your 240Hz monitor is essentially giving exactly the same persistence as 60fps at 60Hz -- on the same panel. 60fps@240Hz has identical motion blur as 60fps@60Hz on the same LCD panel tech. So if your 240fps suddenly instantly slows down to 120fps or 60Hz, you'll see sudden appearance of motion blur. At 240Hz, you you will observe that the 240fps UFO has approximately one-quarter the motion blur of the 60fps UFO. This is the case at least for a good TN 240Hz monitor (one that does not have too many overdrive issues). TL;DR: You said your motion blur suddenly appears/disappears mysteriously. The "sudden appearance" of motion blur is sometimes simply a framerate-halving or framerate-quartering problem caused by a multimonitor setup. This is not always the cause, but unfortunately common. There are other causes (which we'll still have to sleuth) if this is not the issue. Sleuth Attempt #1 -- Therefore, if your game is looking like 240fps UFO then sometimes suddenly look suddenly blurrier like the 60fps UFO sometimes..... May I be Sherlock Holmes and ask, do you have a 60Hz monitor attached to your computer as a secondary monitor?. Bingo. Mystery solved. Unplug/disable it and your problem is solved. Sleuth Attempt #2 -- If you are running only 1 monitor, then something else is causing a potential problem. Can you turn on the framerate display in Fortnite and watch it? Find out if the framerate is halving/quartering when the motion blur suddenly appears. Enable the "Show FPS" setting in "Video" tab of Fortnite. Report back on the changes in framerate you see when you see motion blur suddenly appear. If you see wild fluctuations in framerate that aren't Hz-aliasing related (Mathematically, simple 113fps has twice the motion blur of 226fps -- so any sudden framerate halving of any kind -- will always double tracking-based motion blur on a non-strobed LCD display) ......then try turning off AA and slightly reducing detail level, then this may help stabilize the framerate.